Shipyard Exodus circa 1960 | Flickr - Photo Sharing! jamespcullen, jana bachelon, normko, and 8 other people added this photo to their favorites. Nice old photo! Do you know what street it is? Actually at this point it's NOT Queen's Road. The left side of the picture is Queen's Quay - the street and the buildings on the right are in Station Street. This picture is taken from Bridge End. Andrew McMechan's Newsagent, Stationer, Confectioner & Tobacconist, to the right is at 2 Bridge End, this is their side entrance in Station Street. Just past it is Joe McKee's, he was a Commercial Agent and Bookmaker/Turf Accountant. Next is the side entrance to Wilson & Leeper, who in the 1960s were automobile engineers before specialising in lawn-mowers and changing their name in 1976 to Gibson & Leeper. They moved to Prince Regent Road in 2003 and closed last month after losing the Mountfield distribution contract! Station Street ran from 2 Bridge End to the coal yards in Queen's Quay. 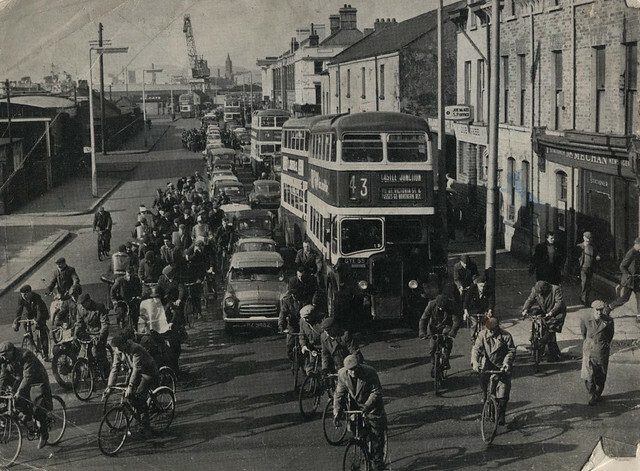 Queen's Road (where Harland & Wolff were located) was off Sydenham Road, quite a distance from where this photo was taken. The bus at the front is a Daimler CWA6, Reg No GYE55, new to London Transport at Chiswick in Apr 1945 (Fleet No D66). After a transfer to Leeds it was acquired by Belfast Corporation Transport Department in December 1953, rebodied with a Harkness body and given the Fleet No 470. It remained in service until 1970! Ah come on Gerry - name the guys in the photo!! My name is David Henderson. I am a final year student studying Interactive Multimedia Design at the University of Ulster, Jordanstown. For my final project (a project where each student gets to design an application or significant piece of media), I am creating a short video advertising the city of Belfast. The video will consist of motion graphics, sound, and interesting facts about Belfast. I hope to include information on the history, present and future of the city. With so many new and exciting developments happening in Belfast at present and in the near future there is a lot of scope which can be included. I am designing a gallery of Belfast's past, present and future and was wondering if I could use some of your photographs in the gallery, I could link through to your Flickr page. This would help me out a lot. we would like to use this photo in a forthcoming Draft Bicycle Strategy for Northern Ireland. Would you be content for us to do this?